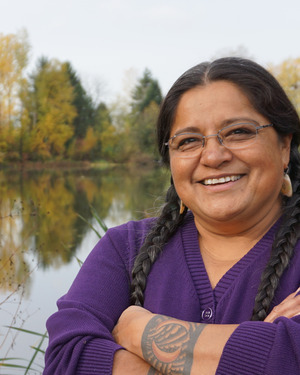 NOVEMBER’S DISCOVERING OUR STORY TV PROGRAM | Wisdom of the Elders, Inc.
We’re proud to announce that our guest for November’s Discovering Our Story TV program will be Oregon House Representative Tawna Sanchez. Tawna Sanchez was born of Shoshone-Bannock, Ute, and Carrizo descent and raised in Portland, Oregon. She received a Bachelor’s of Arts from Marylhurst University and a Masters in Social Work from Portland State University. For most of her life Tawna has been active in the fight for indigenous and women’s rights. She protested coal and uranium on native reservations and was a leader of international organizations like the Indigenous Women’s Network and the International Indian Treaty Council. A major focus of Tawna’s work has been in the area of domestic violence. Prior to joining NAYA, she was a domestic violence advocate at the Bradley Angle House and is the founder of a nationally recognized Native American domestic violence intervention and prevention program that has successfully served thousands of Native American families. She has been active at the state level as well, serving on the Oregon Domestic and Sexual Violence Advisory Board. She is currently serving in the Oregon House of Representatives. She represents the 43rd district, which covers parts of north-central Portland. Wisdom of the Elders Discovering Our Story TV program airs Sunday November 5th at 1pm on Channel 11 and rebroadcasts on the 7th (10:00pm on Comcast channel 22) and the 10th (9:00am on Comcast channel 23).